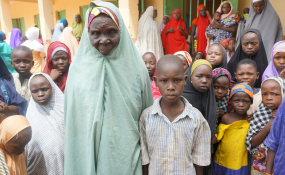 Informal IDPs in rural Gombe State (file photo). The officer in charge of Tuberculosis and Leprosy Control Unit in Gombe State, Dr Mustapha Musa, has said that the state stand the risk of an increase in the number of undetected leprosy cases. Musa told journalists in Gombe yesterday that the alarm followed the non-replacement of some retiring technical field officers who were responsible for detection of cases. The expert attributed the problem to lack of support by the Netherlands Leprosy Relief Programme in the last one year. According to him, the Netherlands Country Office situated in Jos, Plateau State, was closed down in 2016, there has been no support for leprosy. Musa said that the office was supporting 13 states in the country, Gombe inclusive. He noted that the support, which was previously given to them, was contributing to early detection and management. "The Netherlands office was providing Predinisolone and Rifampicin tablets for early treatment of leprosy to prevent deformity as well as technical support in terms of training staff who will go down to communities to detect cases. "Our technical expertise who are trained on early detection of leprosy are retiring and we are lacking funds to train those to replace them. "We are no longer receiving support from Netherlands so government at all levels need to wake up and provide funding for training and all the necessary things needed for the programme to continue," Musa said. He said from January 2017 to date, only 16 new cases were detected, adding that the number has drastically dropped because of the dwindling support. "Decline in number of cases in Gombe State does not translate to lack of the cases completely, but the lack of support to go to the communities and detect new cases," he said. He however, commended the World Health Organisation (WHO) for its intervention.